Natural Apple Lip Balm will help soothe your lips and moisturize with conditioning coconut, jojoba oil and moisturizing Mango butter. Natural Apple Lip Balm will help soothe your lips and add moisture. Made with conditioning coconut and jojoba oils along with moisturizing Mango butter. 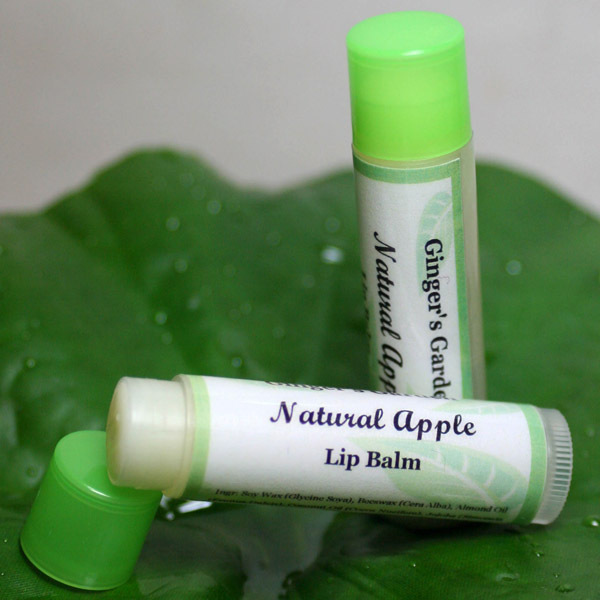 Natural Apple Lip Balm has no color and is lightly sweetened. Comes in a swivel up tube. Use as often as needed. Each tube comes shrink wrapped for your protection. Buy one for your pocket or purse and keep another one in your home or office. Soy Wax (Glycine Soya), Beeswax (Cera Alba), Almond Oil (Prunus Dulcis), Coconut Oil (Cocos Nucifera), Jojoba (Simonsia Chinensis), Mango Butter (Mangifera Indica), Vit. E, Natural Apple Flavor, Sucralose.